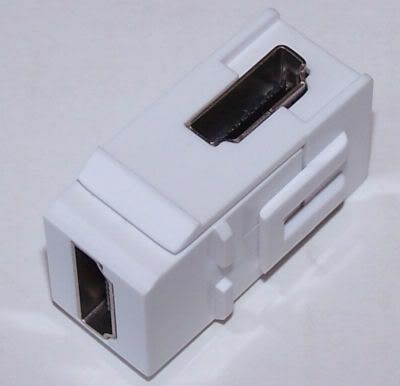 HDMI coupler keystone jack is designed to work with any standard keystone wall plate. Fits in a standard keystone cutout, 1.3b Certified Female HDMI on front and back. Keystone is rotated 90 degrees to insert into any standard keystone faceplate. Wall plate not included. This is an HDMI Insert only. Overall depth: 1 and 1/ 4". Dual layer shielding for superior Rejection of interference. About Keystone Wall Plates Keystone" is a generic term for the inserts that snap into special holes in wall plates and rack mount plates. There is no official mechanical standard and several incompatible versions have evolved.